Protesters around the world targeted major Olympic sponsors Wednesday, urging them to speak out just ahead of the Winter Games. NEW YORK — Protesters in cities around the world targeted major Olympic sponsors Wednesday, just ahead of the Winter Games in Sochi, urging them to speak out against Russia’s law restricting gay-rights activities. Two more sponsors of the U.S. Olympic team condemned the law, but leading global sponsors did not join them. “”No, no to Russia’s anti-gay law,” chanted several dozen protesters in Paris who gathered in front of a McDonald’s restaurant at the Place de la Republique. The fast-food chain is one of the International Olympic Committee’s 10 top sponsors for the Sochi Games, which open Friday. Protests also took place in London, Jerusalem, St. Petersburg, Russia, and elsewhere. In all, 20 demonstrations were planned by the advocacy group All Out and its allies. McDonald’s, like other top IOC sponsors, reiterated that it supports human rights and opposes discrimination, but its statement did not mention the Russian law. Coca-Cola, another prime target of protests, also didn’t mention the law in its latest statement, though it described itself as a strong supporter of the lesbian, gay, bisexual and transgender community. “We do not condone intolerance or discrimination of any kind anywhere in the world,” Coca-Cola said. Visa, another IOC top sponsor, issued a similar statement, as did Dow Chemical, which said it is “engaged with the IOC on this important topic.” General Electric, an IOC sponsor since 2005, declined comment. In contrast to the cautious approach of IOC sponsors, three sponsors of the U.S. Olympic Committee chose to speak out explicitly against the Russian law. “Russia’s law is harmful to LGBT individuals and families, and it’s harmful to a diverse society,” it said Tuesday in a blog post. Following suit on Wednesday were DeVry University, a for-profit education company, and yogurt-maker Chobani. “We are against Russia’s anti-LGBT law and support efforts to improve LGBT equality,” said Ernie Gibble, a DeVry spokesman. AT&T’s move was praised by leading groups in the coalition that has been working for months to pressure sponsors into speaking out. The Russian law, signed in July by President Vladimir Putin, outlaws pro-gay “propaganda” that could be accessible to minors. Critics say it is so restrictive and vague that it deters almost any public expression of support for gay rights. Nonetheless, about a dozen Russian activists protested the law Wednesday in St. Petersburg, hundreds of miles north of Sochi. 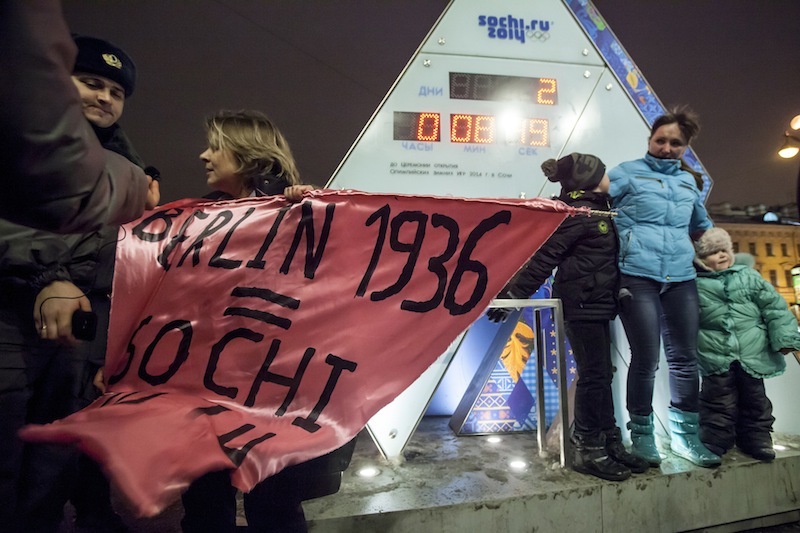 Two unfurled banners reading “Berlin 1936 = Sochi 2014,” referring to the Olympic Games held in Nazi Germany. One-person protests are legal in Russia, and the two activists holding signs were spaced far enough apart that neither was arrested. 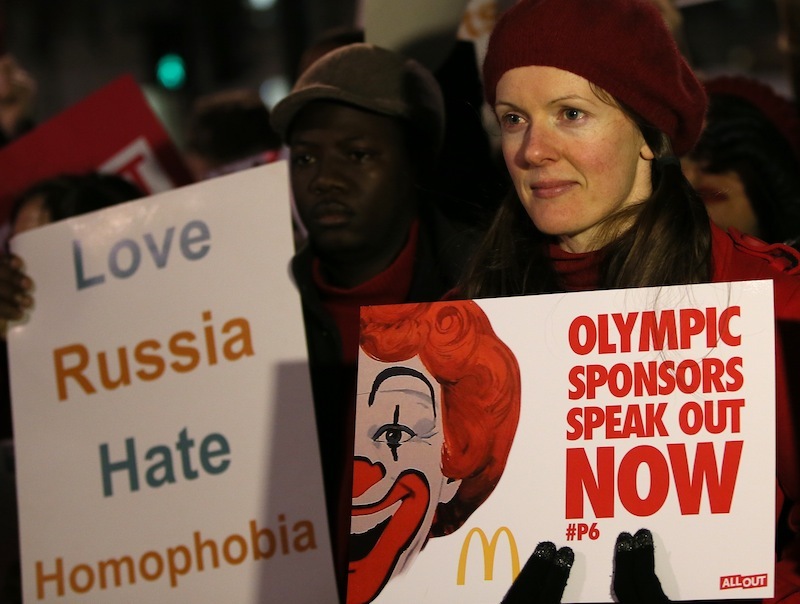 In London, about 150 people rallying outside Prime Minister David Cameron’s office urged McDonald’s and the IOC’s other sponsors to speak out. To date, the IOC and its top sponsors — who pay millions for the rights to use Olympic symbols in television commercials and other marketing — have expressed general opposition to discrimination and pledged to ensure that people gathering for the Sochi Olympics wouldn’t be affected by the law. IOC spokesman Mark Adams said Wednesday the committee and the sponsors have been in constant communication about several issues in Russia, but he declined to describe the conversations when asked whether the sponsors wanted the IOC to make a specific statement about the law. A coalition of 40 international groups, including Amnesty International and Human Rights Watch, sent an open letter to the 10 top sponsors last week urging them to run ads promoting equality for LGBT people. Human Rights Watch posted a video this week on YouTube of gay people in Russia being bullied, chased and beaten, compiled from footage the group said was uploaded by perpetrators. The video got more than 830,000 views in less than two days. Aside from AT&T, DeVry University and Chobani, sponsors of the U.S. Olympic Committee who were contacted by The Associated Press shied away from explicit condemnations of the Russian law, while expressing support for diversity and opposition to discrimination. These sponsors included TD Ameritrade, Kellogg Co., United Airlines, BP PLC, Nike Inc., Citigroup Inc. and Hilton Worldwide. “Our sponsorship of the USOC is about supporting Team USA, not engaging in political or policy debates,” said Scott Dean, a BP spokesman. Citigroup cited its “longstanding support” for LGBT rights, and added that it backed the USOC’s “ongoing efforts” to address the issue with the IOC.